(L. to R.): Laura Giannarelli as Mrs. Brummett; Wood Van Meter as Raleigh Brummett; Lexi Langs as May Brummett in Gulf View Drive by Arlene Hutton. The touching conclusion to the acclaimed “Nibroc Trilogy” is now playing at the Washington Stage Guild through February 10. Photo Credit: C. Stanley Photography. 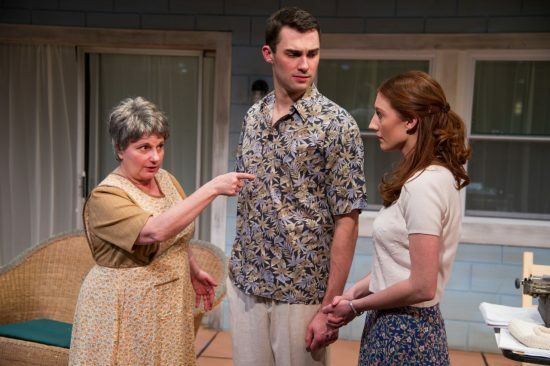 “Gulf View Drive” is the final play of a trilogy by Arlene Hutton. “Last Train to Nibroc” introduced Raleigh and May, and their story was continued in ‘See Rock City.’ To be honest, even though I know a writer doesn’t want to get locked into a set character(s), I’d love to know what happens to their family in the future as things change even more. Luckily for us, the audience, you don’t need to see the previous plays to just fall into ‘Gulf View Drive’ completely. Raleigh (Wood Van Meter) and May (Lexi Langs) are originally from Corbin, Kentucky; they are now living in a small island community on the gulf coast of Florida. This play is sent in 1953-54. Raleigh served in WWII but was discharged because of epilepsy. In the intervening years, the couple eloped; Raleigh lived in New York City for three years to find his voice as a writer and published a critically successful novel; May, who is deeply religious, finished college and stayed behind to look after her parents and begin teaching school; both of their fathers died; Raleigh has moved back to Florida with his wife and makes a good living writing a series about a boy on a boat. As Act 1 begins, May and Raleigh live with her mother, Mrs. Gill (Lynn Steinmetz). Raleigh’s mother, Mrs. Brummett (Laura Giannarelli), has come to stay after the death of her disabled husband. Then his sister Treva (Chelsea Mayo) shows up to stay for Thanksgiving. And beyond. Her children are with her relatives; her husband works in Detroit, and there’s no one left to run the family farm. Mays is blindsided by all of this; no one is communicating clearly. No one is expressing their needs or wants, but certainly, Raleigh’s side of the family is assuming that he will take care of them. Plus, everyone has secrets ranging from illiteracy to a pregnancy from an affair. Because of how a fairly conservative society holds very defined expectations, particularly of women and minorities, there is real fear in being honest, because the consequences are real. Because May lets a brilliant young black boy sit on a stool in the back of the room in her English literature class at the high school, she is faced with a moral dilemma. Raleigh is a writer, and as he finally blasts at the womenfolk, he bought the home, car, television, washer and dryer outright, and “owes no man anything.” But his mother and sister still don’t believe he does “real work.” His mother is facing huge changes—she can’t get a drivers license (even though she regularly drove a tractor) and she and Treva lost the farm they rented after her disabled husband died because the owner didn’t want two women farming it. They had been farming it for years but under the auspices of a man. It might sound melodramatic, but it isn’t. This is a real family with real crises and problems. They are also a family that learns to put themselves in the others’ shoes and start talking. It doesn’t solve everything, but it gives breathing space, and you can see the characters start to dream and grow. There is some hope at the end. As Raleigh, Van Meter is a stalwart of a man, but one who has never felt as good as his daddy in his father’s eyes. When he and May finally stop walking on eggshells around each other, you feel the connection growing deeper all the way to the last row. As May, Langs is tightly wound and panicked when she feels left out, but once her reasons are revealed and the depth of hurt bursts out, you feel for this strong woman. All of the cast embody their characters fully. Underneath is a longing for connection and to be useful, and after watching them take halting steps to find their own paths, you root for them. All of the action takes place on a lanai designed by Carl Gudenius and Jingwei Dai. The set echoes the constraints society has placed on all of them and is beautifully claustrophobic. Costumer designer Sigrid Johannesdottir, assisted by Phoebe Workman, further develops the characters through the clothing, hats, gloves and purses; she doesn’t make a misstep in the period anywhere. Bill Largess directs this play gently and inexorably. Even when something bigoted or thoughtless comes out of someone’s mouth, you can’t hate the characters—you feel sorrow for them, and understand that at that time and place, this was their reality. As the second act tension ratchets up, he brings them gently in for a landing at a place of deeper understanding. And the play has some very funny moments. Surrounded by these four women, all of whom want different things from him, Raleigh lets loose with some of the funniest lines. You get that that is his method of maintaining his equilibrium and sanity. In one of the funniest scenes, he is center stage surrounded by them (he is a tall actor) as he finally snaps some truths out. Their silence is deafening, and then his mother harrumphs and you just watch him wilt. This is a deft play that understands that every era has its downside, and it takes real courage and desire to learn to think and feel more deeply about others. It’s a beautiful coda to a very gifted trilogy. Information: “Grand View Drive” runs from January 17 – February 10, 2019, at Washington Stage Guild, Washington, DC. For more information, please click here.